Disaggregation Theory: where does value accrue in the decentralized web? In Internet 3.0 and the demise of state aggregators, I suggested that because blockchains can capture state (user data) at the protocol level, state aggregators like Facebook would lose their moat, creating an opportunity for decentralized competitors. If we define Internet 2.0 as the widespread disruption caused by aggregation of state, then Internet 3.0 will be defined by the widespread disruption caused by moving state aggregation to the protocol level. In the conversations I’ve had following my post, I was reminded of Ben Thompson’s 2015 post on Aggregation Theory: “A framework to understand the impact of the internet on nearly all industries.” Aggregation Theory contends that as a result of the internet, serving users went from material marginal cost to zero marginal cost. Pre-internet, value was captured in owning distribution and integrating backwards into supply. Post-internet, value was captured in owning distribution and integrating forward into discovery and user data. I focused on aggregation of user data. Together, we see a clearer picture: Internet 2.0 allowed companies to aggregate supply and thus focus on owning discovery and user data. Once discovery and user data was owned, aggregation of user data allowed companies to create distinctive user experiences that competitors could not replicate. By owning the customer relationship, these companies could serve the same customers an expanding set of goods and services. Consider Amazon: a company that started off selling books now wins Emmys and provides cloud services for the world’s largest companies. What happens in Internet 3.0? Let’s first start with another framework that Thompson covers, “The Smiling Curve”, which was originally used to describe how value flows in the IT manufacturing industry, but can be generalized to many other internet industries. For an Internet 2.0 content company, value is highest for discovery, high for supply, and low for distribution. In Internet 2.0, value accrues to the ends of this chart. Does this chart look different in Internet 3.0? In Internet 2.0, supply is high value because any good-will experienced by the consumer will be directed to the content creators (not the publisher). In Internet 3.0, supply should remain high value. Not much changes except for potentially favorable alternative monetization opportunities through blockchain. In Internet 2.0, a fragmented landscape of publishers distribute content and have largely been commoditized. In Internet 3.0, distribution can either be assessed at the base protocol level (e.g. Ethereum) or the app-protocol level (e.g. hypothetical ContentProtocol built on top of Ethereum). In either case, the value is either very high or very low depending on your philosophy. If you believe that the protocol with the highest utility will also be the best store of value, users will want to hold that protocol’s token, which means that the protocol responsible for distribution will be very valuable. This aligns with the “fat protocol” thesis popularized by Joel Monegro. If you reject that thesis, then the value should trend towards zero as the marginal cost decreases to virtually zero. In Internet 2.0, discovery is worth a lot and owned by very few players. In Internet 3.0, discovery will be high value, but the competitive space will be more fragmented because the UX and data moats that the Internet 2.0 companies enjoy will be disaggregated. If we believe in fat protocols, we get a “Frowning Curve.” If we do not, we get a “Smaller Smiling Curve.” In the Frowning Curve, it’s not clear whether more or less value is captured overall, but we see a clear shift of value to distribution. In the Smaller Smiling Curve, less value is captured overall. While the shape of the curve is harder to predict for Internet 3.0, we can observe two clear underlying shifts: aggregation of distribution and disaggregation of discovery. Digging into these shifts help us imagine the transition from Internet 2.0 to Internet 3.0. Aggregation theory allowed the dominant internet companies to focus on the most important part of the supply chain: owning the user relationship. To win over users, a company had to offer the best experience to the user, earning them “the most consumers/users, which attracts the most suppliers, which enhances the user experience in a virtuous cycle” (Thompson). State aggregation (proprietary hoards of user data) enables companies to build insurmountable moats around their user experience. The company that knows the most about their users are better equipped to know what to serve those users at what time. This leads to another UX virtuous cycle whereby great UX leads to more usage, which leads to more user data, which leads to even better UX. What happens when state aggregation goes away? The moat that these dominant companies built with user data weaken, lowering the barriers to entry and enabling a more competitive environment. In the short run, the UX offered by these new entrants will pale in comparison to those built by Internet 2.0 companies for two reasons: less user data and the handicaps of blockchain technology. If we imagine a world where users own their data and share subsets of that data with apps in exchange for personalized service, apps will have access to fewer categories of user data. Further hampering the UX, these apps must operate within the constraints of blockchain technology (e.g. pay fees for on-chain transactions, wait for transactions to confirm). Overall, the UX of the decentralized web will feel a lot less magical. Users will have to make a choice between the superior UX of today’s internet companies and the superior privacy and data sovereignty of decentralized internet companies. Long term, this gap will close as users can offer more data to discovery engines and UX handicaps are removed. But there’s still the probable possibility that decentralized apps will never provide the same kinds of magical (and sometimes creepy) experiences as today’s internet companies. Does this thinking generalize or is it limited to consumer content? Let’s consider the hot topic of decentralized exchange. The supply chain is: suppliers of liquidity, exchange protocol, and relayers. We should expect the same curves. For the centralized exchange, value accrues to the exchange interface (e.g. Binance). For the decentralized exchange, the exchange protocol is often distinct from the exchange interface. If we believe in fat protocols, projects like ZRX will capture value. If we do not, ZRX will not capture value and overall value in the supply-chain is lost. Furthermore, just like content, we would expect aggregation at the exchange protocol level and disaggregation at exchange interface (relayer) level. This framework could be generalized to–from left to right–supply, distribution, and discovery. The pattern should hold for any internet sector where discovery is aggregated and controlled by a few powerful players (for example: ride-sharing, on-demand delivery, room rentals, etc.). As a result, with some exceptions, these three charts–“Smiling Curve”, “Frowning Curve”, and the “Smaller Smiling Curve”–describe value in the centralized web and the two possibilities for value in the decentralized web. The original smiling curve led Stan Shih to reorient Acer, “from manufacturing into global marketing of brand-name PC-related products and services.” What do these new curves mean for Internet 2.0 incumbents and Internet 3.0 challengers? Much depends on whether more or less value will be captured at the distribution level. 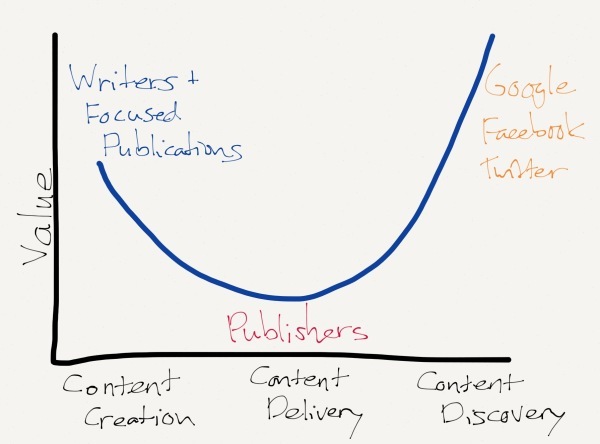 If it’s more, the “Frowning Curve” suggests reorientation into capturing distribution. If it’s less, well, that’s bad news for incumbents (but good news for users, as they enjoy lower costs) and they should delay the decentralized web as long as possible. For builders, there are two primary questions. First, is the type of thing I’m building valuable? If we believe in the “Smaller Smiling Curve”, there’s lower incentive in the long run to build distribution (protocols). Otherwise, we should all fight to own distribution. Second, are the inherent benefits of the decentralized web enough to overcome the UX shortcomings that may last forever? If not, the decentralized web may be further out than we would hope. The recent uproar surrounding the misuse of user data is a strong indication that users will value what the decentralized web offers. So it may be on those of us #buidling to sufficiently prioritize competing on UX. Thinking too much about long-run value capture is likely premature for builders. If the decentralized web takes shape, early builders of the space will have ample time to reorient their projects or start new projects to take advantage of the flow of value. It’s more important to focus on the existential risk: that the decentralized web never comes to be. With that in mind, let’s support each other in continuously leveling up the UX so we have the luxury of worrying about where value accrues in the decentralized web. With trust in large tech companies cratering, what is going right for Telegram? How does a game design framework for building friendships help explain some of Telegram's success?